Wearing an orange robe and clutching beads, fitted into a donut hole. Add the Homer Buddha Vinyl Mini-Figure to your The Simpsons collection! 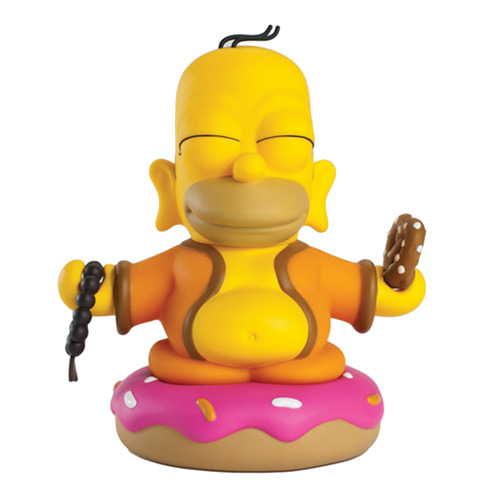 Homer Simpson from The Simpsons TV show gets a Zen makeover in this The Simpsons Homer Buddha 3-Inch Vinyl Mini-Figure. The 3-inch tall vinyl mini-figure finds Homer in Zen mode, wearing an orange robe and clutching beads while sitting on a wonderful little donut with sprinkles. Now in window box packaging! Add to your The Simpsons collection with this Homer Buddha 3-Inch Vinyl Mini-Figure! Ages 15 and up.